AirAsia is optimistic its Philippine operation has turned the corner after a challenging initial three years. Philippines AirAsia has been highly unprofitable since its 2012 launch while Zest also has remained loss-making since AirAsia acquired a stake in the carrier in 2013. AirAsia has restructured its Philippine operation over the last year, making several network adjustments while cutting overall capacity and reducing the size of its Philippine-based fleet. Costs have been reduced and unit revenues have improved through a combination of load factor and yield improvements. But AirAsia still faces challenges in the Philippines market which will have to be overcome for its Philippine operation to become profitable on a sustainable basis and for IPO ambitions to become realistic. AirAsia is planning further expansion at Kalibo, a gateway for the popular tourist island of Boracay where demand has been growing rapidly. The performance of its Kalibo operation could be impacted by the upcoming completion of a runway extension and airport upgrade project at Caticlan, a smaller airport which is much closer to Boracay. This is Part 4 in a series of analysis reports on the Philippine market. The first two reports looked at the performance and outlook of Cebu Pacific’s long-haul operation with a particular focus on the Philippines-Middle East and Philippines-Australia markets. The third report examined Cebu Pacific’s domestic performance and outlook, including the turnaround at its primarily domestic subsidiary Tigerair Philippines. This report examines the outlook for AirAsia’s Philippine operation, which includes affiliates Zest and Philippine AirAsia (PAA), following a recent restructuring. The outlook for the PAL Group, which includes Philippine Airlines and regional subsidiary PAL Express, will be analysed in a forthcoming report. The AirAsia Group launched Philippines AirAsia (PAA) in late Mar-2012. PAA was a problematic franchise from the beginning as it faced lengthy start-up delays which forced its first A320 to remain grounded for seven months before the airline finally secured approval to commence operations. 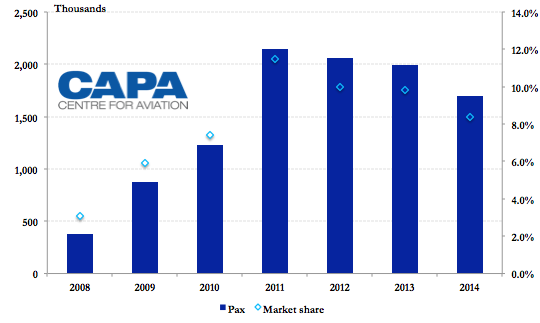 PAA was highly unprofitable in its one year as an independent carrier, accumulating losses of about USD30 million from 1-Apr-2012 to 30-Mar-2013, which equated to approximately USD70 per passenger carried. PAA also incurred losses of about USD9 million during the longer than anticipated pre-launch phase in 2H2011 and 1Q2012. As CAPA previously reviewed, PAA struggled to gain traction in a crowded and highly competitive domestic market which at the time had six competitors on trunk routes. 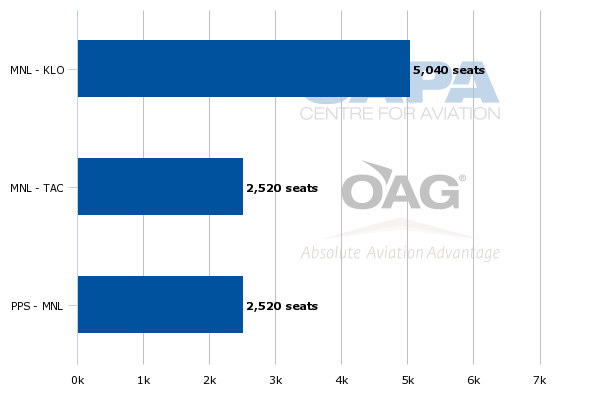 PAA’s average seat load factor was only 56% in 2012. Yields were also unsustainably low while PAA’s costs were relatively high as it failed to achieve economy of scale. The PAA fleet never expanded beyond the initial two aircraft as the AirAsia Group was reluctant to allocate more aircraft to the affiliate, given its initial challenges. PAA tried to improving its position by forging a partnership with Zest Air in Mar-2013, or just one year after it launched operations. The initial deal included PAA, which is 40% owned by the AirAsia Group, taking a 49% stake in Zest Air, with the expectation the airlines would eventually merge. Zest was a much more established and larger carrier, having served the Philippine market for two decades (originally as Asian Spirit). But Zest was also struggling and losing market share. The PAA-Zest deal kickstarted much needed consolidation in the Philippine market and improved the long-term outlook for both carriers – and the AirAsia Group – in the Philippine market. But the process of bringing the two airlines together has been extremely slow due mainly to the several layers of approvals required in the Philippines. PAA and Zest continue to operate under their own AOCs although the AirAsia Group has been seeking approval to transition the two affiliates to a single operation. Zest’s original owner, the Yao Group, still currently owns a majority 51% share but is expected to sell part or all of its stake to PAA. Zest was able to adopt the AirAsia brand in late 2013, resulting in a quasi-merger. All Zest flights have since been sold alongside PAA-operated flights on the AirAsia website and other AirAsia distribution channels. PAA and Zest combined carried 3 million passengers in 2014 with an average seat load factor of 70%, according to AirAsia Group financial reports. The AirAsia Group stated its Philippine affiliates carried 2.2 million passengers in 2013 with an average load factor of only 63%. But in reality passenger traffic for the two carriers shrank slightly in 2014 as the 2.2 million figure for 2013 only includes Zest for part of the year while the 2014 figure of 3 million includes Zest for the full year. The passenger traffic reported for 2H2014 compared to 2H2013 is more indicative as Zest figures are included in both sets of data, providing a like for like comparison. For 3Q2014 AirAsia reported a 15% drop in passenger numbers for its Philippine affiliates to 618,000. 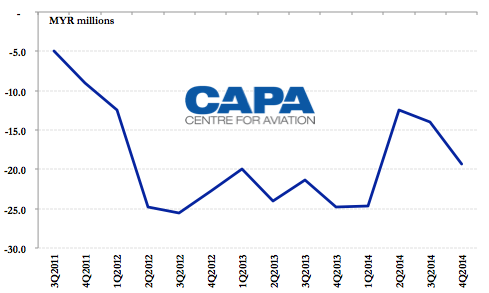 In 4Q2014 the drop in passenger traffic accelerated to 24% as 594,000 passengers were carried. Based on Philippine CAB data, Zest carried 2.6 million passengers in 2013 (1.989 million domestic and 617,000 international) while PAA carried 372,000 (157,000 domestic and 215,000 international). In 2012, the last year full year both carriers operated independently, Zest transported 2.4 million passengers (2.061 domestic and 324,000 international) while PAA carried 270,000 (159,000 international and 111,000 domestic). Note that the AirAsia Group reported 311,000 passengers for PAA in 2012 but counts all revenue passengers including no-shows while the CAB excludes no-shows as it only counts passengers that boarded. Full year 2014 data is not yet available as the CAB has not yet reported international figures for 2014. But Zest’s domestic traffic dropped by 15% in 2014 to 1.7 million, according to Philippine CAB data. Zest domestic traffic has dropped steadily since reaching a high of 2.2 million in 2011. At that point Zest captured an 11.5% share of the domestic market. In 2014 Zest’s domestic share was only 8.4%. 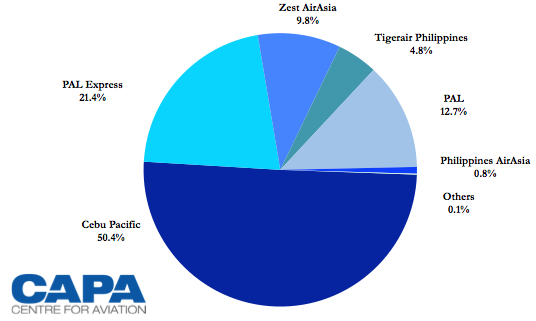 As CAPA highlighted in the last instalment in this series of reports, the AirAsia Group's share of the Philippine domestic market dropped in 2014 to only 9.8%. In addition to the 8.4% share for Zest this includes a 1.4% share for PAA. Zest has cut domestic capacity significantly since it essentially merged with PAA in 2013. After the deal was completed Zest quickly pulled out of regional markets as it grounded its fleet of Xian MA60 turboprops. The AirAsia Group was keen to phase out the turboprop operation as it adheres to a strict single-type model with all its affiliates operating all-A320 fleets. In 2014 Zest continued to reduce domestic capacity as its fleet of A320 family aircraft reduced from 15 to 13 aircraft. The AirAsia Group ended 2014 with only 15 aircraft in operation in the Philippines, including 13 A320s at Zest and two A320s at PAA. The group reported a 32% reduction in seat capacity for its Philippine affiliates for 4Q2014 as three aircraft were removed from service. The AirAsia Group stated in its 4Q2014 results presentation that the group’s Philippine-based fleet will shrink to only 14 aircraft by the end of 2015. But capacity could increase as PAA and Zest have been improving aircraft utilisation rates, which had been below LCC norms. Higher average utilisation rates are one of several initiatives identified by the group as part of an initiative to reduce unit costs. The AirAsia Group reported a 24% reduction in CASK for its Philippine operation in 4Q2014. The group is expecting a further reduction in unit costs in 2015 as a cost optimisation project continues to be implemented. The group also stated that its Philippine affiliates started recording unit passenger revenue and RASK growth in 4Q2014. Exact yield figures were not provided but PAA/Zest did report an 8ppt improvement in seat load factor for 4Q2014 to 72%. The AirAsia Group also stated in its 4Q2014 results presentation that RASK at its Philippine affiliates was up 30% in Jan-2015 while load factor was up 12ppts, giving it the confidence that the turnaround around is nearly complete. The AirAsia Group’s Philippine affiliates likely remained in the red in 1Q2015 but are expected to be profitable in 2Q2015. This would mark the first profitable quarter for AirAsia in the Philippines. While a profit for 2Q2015 would be meaningful, the second quarter is typically by far the strongest quarter in the Philippine market. Most of the profits generated by Cebu Pacific and PAL in 2014 were booked during the second quarter. AirAsia will need to show its operation is profitable for the full year before any turnaround is deemed complete. The group's Philippine affiliates have so far accrued losses totalling about MYR260 million (USD72 million based on the current exchange rate). AirAsia has clearly benefited from improved market conditions in the Philippines. The two largest carriers in the Philippines, Cebu Pacific and Philippine Airlines (PAL), both posted significant improvements to their bottom line in 2014. But restructuring initiatives also has been a contributor to the improvement at PAA and Zest. Cost reductions and network changes in particular has put AirAsia in a better position in the Philippine market. PAA and Zest have suspended several routes. The network changes began in 2013 as PAA dropped its base at Manila alternative airport Clark to focus on Manila International, where PAA was able to expand using slots from new sister carrier Zest. More changes were implemented in 2014 as AirAsia increased focus on the international market. Several new routes were launched 2014 and 1H2015 while others were suspended. 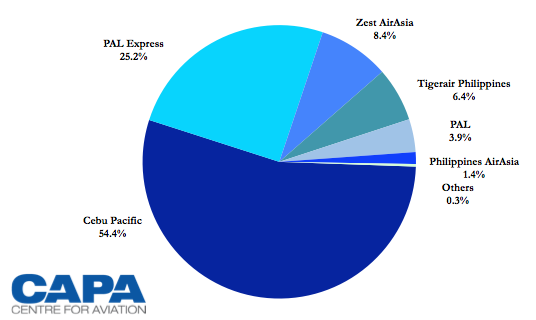 PAA and Zest combined currently operate 11 domestic and 9 international routes, according to OAG data. This includes nine international and eight domestic routes at Zest and three domestic routes at PAA. The above chart excludes Manila-Hong Kong, which Zest plans to launch on 8-May-2015 with four weekly flights. Hong Kong, which is made possible by the recent extension of the Philippines-Hong Kong air services agreement, will be Zest’s seventh international destination after Seoul (ICN), Kuala Lumpur (KUL), Kota Kinabalu (BKI), Shanghai (PVG), Busan (PUS) and Macau (MFM). Seoul, Zest’s largest international destination, is currently served from Manila (MNL), Cebu (CEB) and Kalibo (KLO). Zest also now serves Kota Kinabalu from both Manila and Cebu, having added Cebu-Kota Kinabalu in late Mar-2015. Busan and Shanghai are only served from Kalibo while Kuala Lumpur and Macau are only served from Manila. Domestically AirAsia operates six routes from Manila and two routes from Cebu. All three of PAA’s domestic routes are also served by Zest. 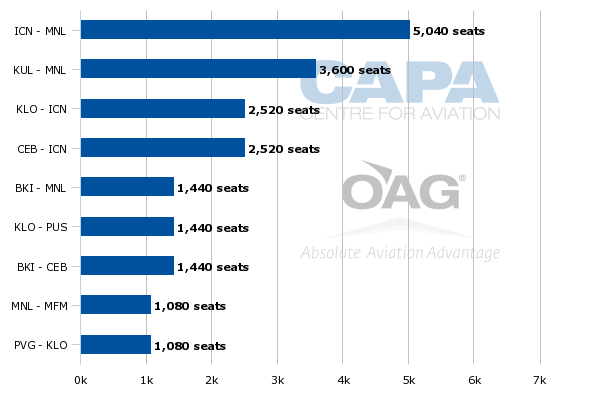 PAA and Zest currently provide about 91,000 weekly seats, according to CAPA and OAG data. About 22% of this capacity, or 20,000 seats, is in the international market. But the AirAsia Group overall has about 25,000 weekly seats in the Philippine international market when including flights operated by its Malaysia-based subsidiary. Manila continues to be the main hub for Zest and PAA, where the group has been keen to use Zest’s slot allocation fully. But AirAsia has been expanding its international operations from secondary cities in the Philippines, where it sees opportunities to stimulate growth in underserved markets. For example total AirAsia capacity at Cebu, the second largest city in the Philippines, has increased over the last year by 45%. The AirAsia Group currently has about 30,000 weekly seats at Cebu compared to slightly over 20,000 seats in May-2014, according to CAPA and OAG data. The group now has three domestic and three international routes at Cebu. AirAsia has said further expansion at Cebu is planned for 2015 including new international routes to Hong Kong, Japan and Singapore. There is plenty of room for the group to grow at Cebu as it currently only has about a 14% share of total seat capacity at Mactan-Cebu International Airport. But AirAsia will have to overcome stiff and intensifying competition as Cebu Pacific and PAL have also been pursuing expansion there. The AirAsia Group is also planning to pursue further expansion at Kalibo and is looking at potentially operating international routes from emerging Philippine tourist destinations such as Puerto Princesa. AirAsia currently only serves Puerto Princesa, which is located on the island of Palawan, from Manila. The AirAsia already links Kalibo with four international destinations – Busan, Kuala Lumpur, Seoul and Shanghai. Manila-Kalibo is also the group’s second largest domestic route after Manila-Cebu. 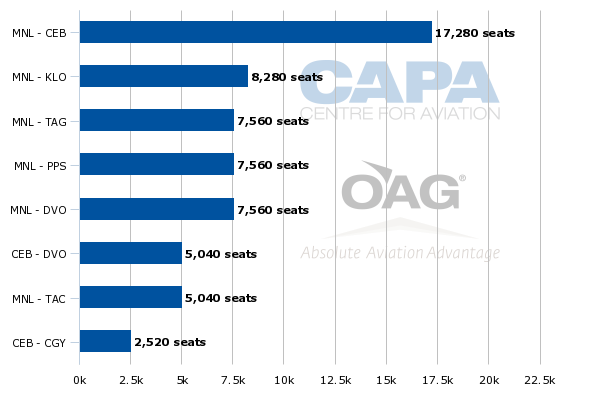 AirAsia currently accounts for a leading 38% share of total seat capacity at Kalibo (includes PAA, Zest and Malaysia AirAsia). 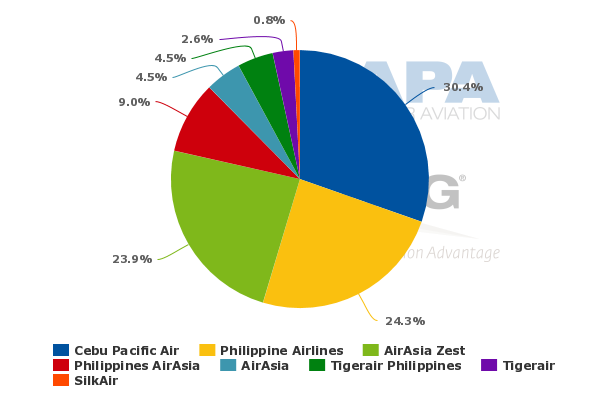 Cebu Pacific has about a 35% share (includes Tigerair Philippines) while the Philippine Airlines Group (includes PAL Express) has about a 24% share, according to CAPA and OAG data. AirAsia is bullish on further growth at Kalibo, which recently completed an expansion project. But the Kalibo market could be impacted by the upcoming completion of an airport expansion project at Caticlan, which is located opposite Boracay. Kalibo is about 70km from Boracay and the journey from the airport to the island typically takes at least two hours compared to less than a half hour for the ferry from Caticlan to Boracay. Caticlan can only currently accommodate turboprops. But the newly extended runway, which is expected to be open by the end of 2015, will be able to handle narrowbody aircraft. The terminal is also being upgraded to handle international flights. The anticipated launch of international services at Caticlan could impact AirAsia’s position at Kalibo just as PAA tries to complete a turnaround and pursue an initial public offering (IPO). PAA has begun preparing for an IPO in 2016. But potential investors will likely prefer to see consistent profitability at AirAsia’s Philippine affiliates and some evidence that the multiple challenges AirAsia has faced since establishing its joint venture in the Philippines have been completely overcome.